Just to be upfront about the whole thing: survival games are not usually up my alley. I haven't played a ton of them. However, splitscreen co-op games are almost always up my alley. Thus, Outward found its way into my PlayStation 4 collection mere hours after release, and now here we are some 17 days later. While I've played a fair amount of the game solo, most of my time with Outward has been spent in local multiplayer. It's rare to come across any sort of third-person title with local splitscreen these days that isn't something like the alien-shooting action of Earth Defense Force. But unlike EDF, Outward is a slow game. 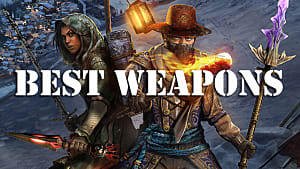 In some ways I consider it a little too slow, but despite its drawbacks, my co-op partner and I have kept slithering back to it in an effort to conquer it and be able to say we finished the adventure. Some may try to convince you Outward is an RPG, but if you go into it with an RPG mindset, you're going to be disappointed. At the start of the game, you're tossed into a sticky situation: The ship you were on capsized, and your fellow villagers demand you pay back the debt of blood. Because that's just how they do things in Cierzo, you have five days to pay off that debt. This is the first of a handful of quests in the game, and it doesn't give the greatest first impression. Five days to pay 150 Silver or get a Tribal Favor and pay off the debt? Right at the start of the game? Ludicrous. But as with many things in Outward, there are many ways to complete this task. You can seek out a Tribal Favor (which is actually very easy) or make the 150 Silver, it's up to you. You can even ignore the obligation completely and just let them take your lighthouse and the stash within. Again, it's up to you. That's because there's a great deal of freedom to the game. 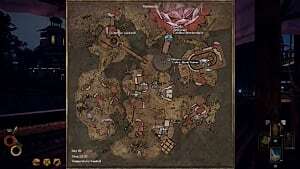 You can seek out marked spots on your map for loot, or you can stick to the tasks quests set you to do. Outside of mainline quests, you can do just about anything in any order you would like. After paying your blood debt, three characters in town tell you they are leaving and where to find them, and you can choose whether to prepare for the long journey to get to one of the cities they're traveling to and join a faction or just, well... Do whatever you want. 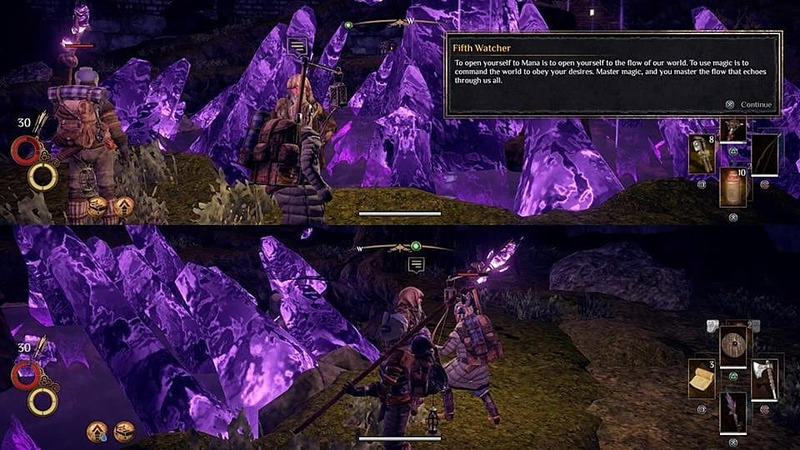 It pays to go straight for joining a faction so you can hit the Ley Line and get mana to learn and use spells, but you certainly don't need to do it to explore the region of Chersonese or even other regions. 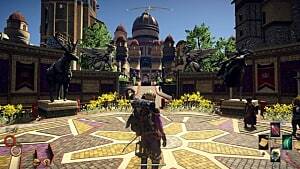 Players are granted freedom in Outward in many regards. 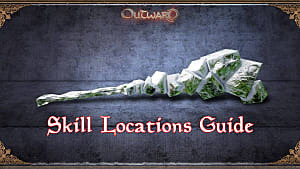 You can learn basic skills for every class on one character (and specialize in three classes), you can explore just about anywhere as long as you're prepared for fight or flight, and you can get yourself killed in any number of new and exciting ways. You have to manage your character's hunger, thirst, health, mana, temperature, and tiredness. On paper, that sounds like a lot, but managing them rarely gets overwhelming in itself. You might die from a disease once in a while, but more often than not, Outward's primary stress-inducer and death source is combat. A game with all these things to keep track of should have a number of ways to keep a character healthy, and that's true here. 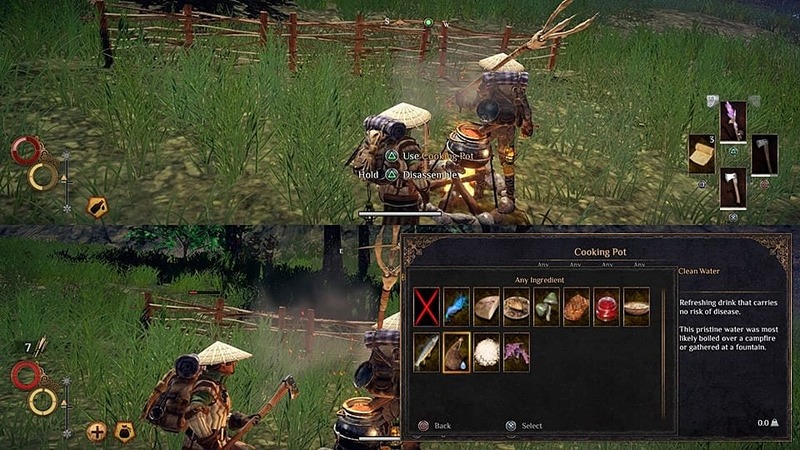 A variety of food and drink await, many with beneficial regenerative or defensive effects; and armor and clothing have a heavy impact on character temperature resistances. There's a lot of flexibility within these three facets. Sleep is another issue, however. More often than not, you'll be sleeping to heal your burned health and stamina rather than your character getting tired. If you have a bedroll or tent (you should), you can set it up and have a rest for as long as you need. You set how long you want to sleep, repair, and stand guard when you interact with a resting spot. 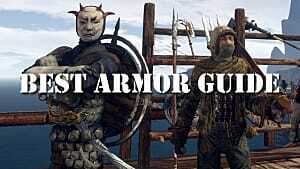 Standing guard is a must in most areas, otherwise you risk being ambushed. 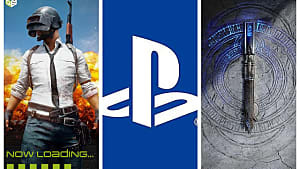 These systems all fall in line with what one expects from a survival game. You're basically three steps away from manually breathing, although it's not as complicated as something like SCUM. 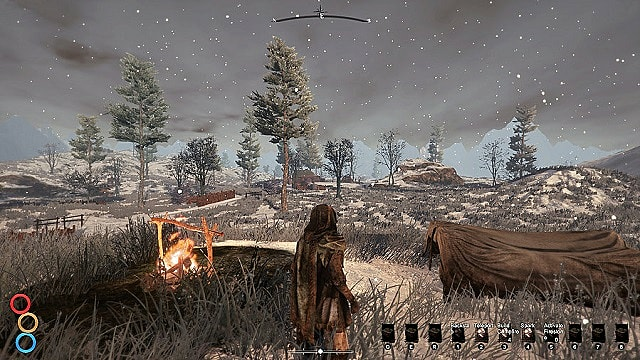 With all of the above in mind, you spend a lot of time wandering around lost in Outward. You have a map with the region's big notable areas marked, but no marker for where you are. You have to learn the land by way of landmarks to get around without getting lost. I like this middling option, since the map as it is helps just enough to figure things out. Even ignoring the lack of player marker on the map and how it affects exploration, it's still easy to get lost. There are nooks and crannies everywhere, tiny little caves with loot or mini-dungeons sprinkle the landscape. Dungeons themselves are difficult to navigate; don't be surprised if you end up wandering in a circle in most of the dungeons you wander into, because that's just how it is. The game makes it very clear to anyone playing that their character is not special. Most new players die to the hyenas outside Cierzo more than a couple times. Combat in Outward is slow and grueling. As you might expect from this sort of game, it has a dodge and block system. You can perform these actions as long as you have stamina, though you need at least a weapon equipped to block. When blocking, you can be hit a certain amount of times to be staggered. An impact meter at the bottom of the screen indicates how much more you can take before an enemy can knock you back. You can see that very same meter above their heads, and you can stagger them in kind. Dodge rolling, blocking, and circling your enemies is a huge part of combat in Outward. If you do not do these things, you'll die. It's as simple as that. You have to do it, and it is rarely a fast process unless you've got some stellar gear and are whacking on a relatively weak enemy. 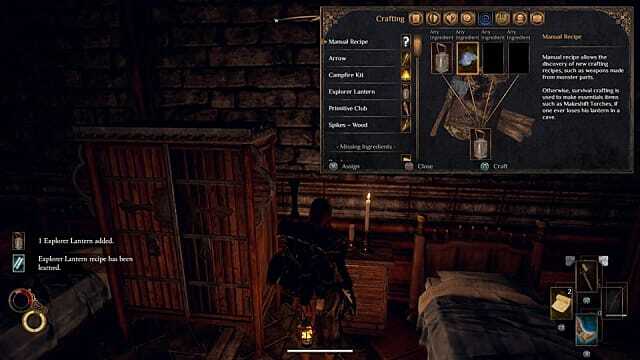 The game's backpack system, which enforces more inventory management than you might be comfortable with in itself, also makes you unable to dodge quickly with most backpacks equipped. They're pretty heavy, you know. Luckily it's possible to quickly drop your backpack before you initiate or even mid-combat from a safe distance, though picking it back up is a slightly longer animation. As you explore, you'll come across NPCs who will teach you new skills. Many are class-specific, though the best are tied to classes. Skills and spells (should you go that route, you can specialize in three classes at once) are your key to survival and make combat less grueling, but you will almost always have a challenge. It's the nature of the game. You will probably die in Outward, maybe too much for comfort. I think you have to be a certain sort of masochist to really enjoy yourself here, particularly on console. Impatient players need not apply. The PlayStation 4 version of the game has some real trying load times, particularly on the base console (not the Pro). Load screens so long you'll wonder whether it's intended to wear you down. It's not, it's just an unfortunate aspect of the game on console. I've heard base Xbox One players have similarly long load screens, and also that they're really not all that bad on PC. There's also such a huge graphical jump between PC and console in Outward. If you want proper lighting, go with PC. Despite the load times on PS4 and how unimpressive it is to look at, it's still one of few options on the console for a comprehensive local two player experience that isn't an outright action game. Outward is by no means a perfect game. It really shows that a mere 10 people worked on it, but they really worked their asses off, and that shows, too. While some small dungeons or caves may be mostly pointless, while the world isn't the most populated or interesting, while the load screens may lead to 30+ second-long awkward silences between my co-op partner and I... It's still a fun time, especially with someone else. 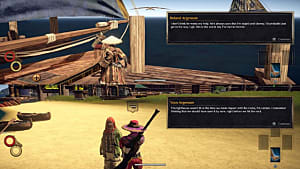 Outward looks and feels like an older RPG without the RP elements. Some may shy away from that description, but it works. Things you might take for granted in most other games feel satisfying here. Learning new crafting recipes, saving up for and getting that nice heat-resistant top, or just not dying to giant mantises all feel rewarding because you know you worked for them and are a clear indicator of how your character has grown. Even games that are a little lacking can be engaging and fun, Outward is one of many titles that prove that is very much the case. Though ultimately this is one best played with a partner rather than on your own.